Morbid Tales zine #1-6 Megapack. All the issues of this cult magazine publication! Over 350 pages of cut-n-paste zine done in the old style with so much to read! SABBAT, IMPALER, BLASPHEMY, RAMMER, CLOVEN HOOF, WATAIN, TOXIC HOLOCAUST, ONSLAUGHT, SLAUGHTER (CAN), SACRIFICE, APOKALPYTPIC RAIDS, Tom Angelripper, VULCAIN, REV. 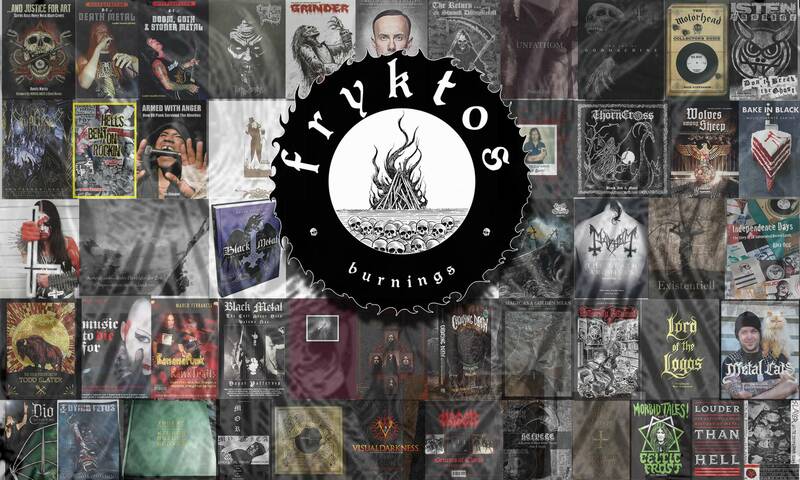 BIZARRE, COUNTESS, EXCITER, Celtic Frost, Weapon, Midnight, Trench Hell, Ares Kingdom, VOIVOD, METALIAN, DARKTHRONE, PORTRAIT, MASTER’S HAMMER, PAGAN ALTAR, FAUSTCOVEN, SOOTHSAYER, MORNE, INEPSY, LAMP OF THOTH, FLOWER TRAVELLIN’ BAND, SACRED BLADE, ELIXIR, TROP FEROSS and CAULDRON, plus London/Prague/France/Montreal record hunting guides and a special report on the COUNTESS/BARATHRUM/SABBAT 1997 tour, written by Orlok of COUNTESS. a regressive full-size fanzine featuring in-depth interviews with VOÏVOD, METALIAN, DARKTHRONE, PORTRAIT, MASTER’S HAMMER, PAGAN ALTAR, FAUSTCOVEN, SOOTHSAYER, MORNE, INEPSY, LAMP OF THOTH, FLOWER TRAVELLIN’ BAND, SACRED BLADE, ELIXIR, TROP FÉROSS and CAULDRON. This monster – which took two years to write – also includes live reviews, London/Prague/France/Montréal record hunting guides, 80+ album/EP/demo/fanzine reviews, an Italian horror metal report as well as an exclusive COUNTESS/BARATHRUM/SABBAT tour report from 1997, written descriptively by Orlok of COUNTESS. In addition, the ‘zine contains the bizarre Hell Bent for Cooking special; a 13-page “cookzine” featuring 24 recipes of entrées, main meals and drink mixes from UG/non-UG metal bands around the world!! 120 pro-printed pages of total metal madness! The zine was created in late 2004, and started as a 40-somethin’ half-page fanzine featuring three bands. The idea to make the zine had came to me that it would have been cool to do a fanzine to distribute in Ottawa record shops and at shows. I found my ideal zine partner when I saw that my friend Jo’s had a punk fanzine (Born 20 Years Too Late). We talked about doing a metal one… So he came up with the name “Morbid Tales” which was obviously very Celtic Frost inspired. Everything was made cut’n’paste and xeroxed locally until I kind of grew tired and started pro-printing it at issue #5. The goal of Morbid Tales is to spread the metal virus all over the world, so I encourage all of you to photocopy your fanzines and give/sell/trade the zines to your friends. I do not want to see it scanned though, as it isa paper-zine and has no place on the internet.